bird door stops will be used at my front door and a bathroom door. I like the idea of shopping online and having it delivered to my front door. I think this table cloth is so pretty. I purchased it for my dining room table. Will add a nice touch to my dining room. Love it ! need a tablecloth and this was beautiful! Looks lovely on the table and cleans well. You can even was them and dry in dryer. I put over cloth table cloth while eating. 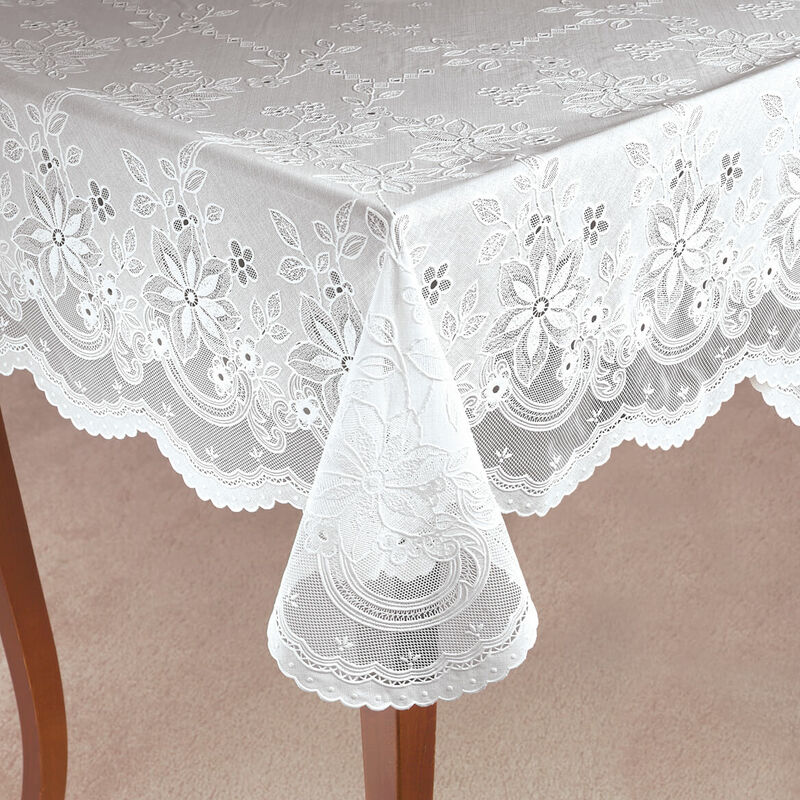 The color of the cloth table cloth shows through the lace and is very pretty. I have ordered vinyl lace white tablecloths from Miles Kimball a few times and found them to be perfect for my needs and inexpensive. Thank You! The quality is AWESOME! Well worth the money! Its beautiful and easy to keep clean. I just wish you had more to choose from. I do not use cloth on my table, to many in the past got ruined but with these, its ok to spill or drop something on it, I just wipe it clean! I picked this table cloth for my church's fellowship hall. I felt it would add a little elegance to our tables. I HAD HAD ONE SIMILAR AND LIKED THE LOOK OF A COLORED TABLECLOTH THROUGH THE WHITE LACE. IT LOOKED ELEGANT WHILE STILL BEING EASILY CLEANED. I DON'T ACTUALLY LIKE THIS PATTERN, BUT THE ONE I WANTED WAS OUT OF ORDER. HOPEFULLY, IT'LL COME BACK AND ILL ORDER ANOTHER! I have bought these 2 Beauitful Vinyl tablecovers for many years. They hold up very well. Plus adds class to my kitchen & dining room. My family & guests always complement. They are also machine washerable & put in dryer for just a few minutes they look awesome... I have also bought them as gifts. Thank YoU... Lynn P.
I chose this because it looks nice and will protect my table. 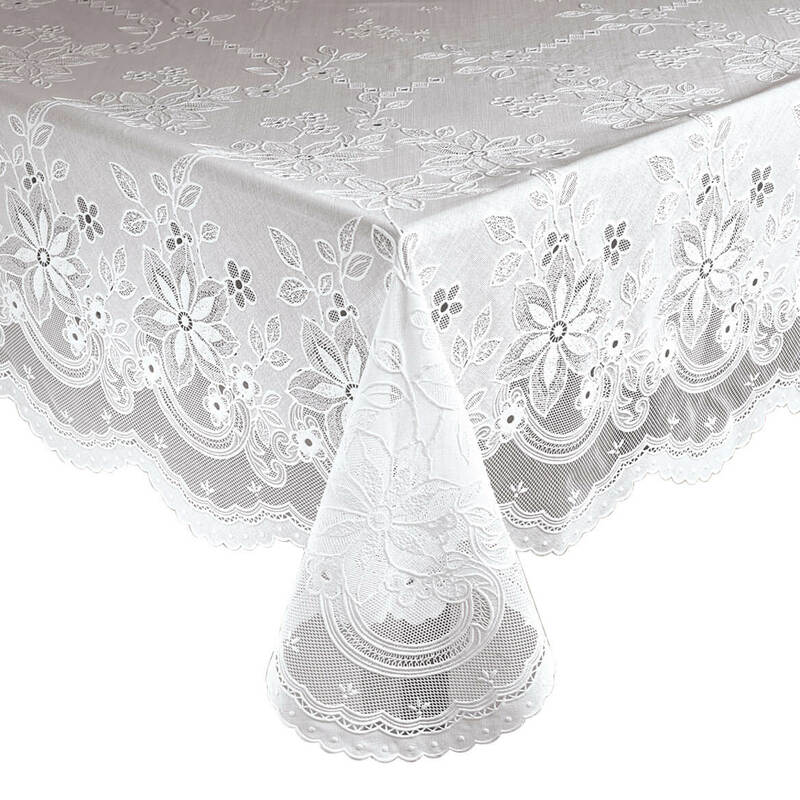 My aunt wanted a vinyl lace tablecloth and this looked the prettiest. 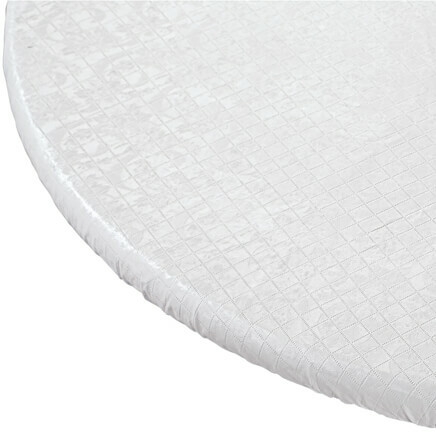 Use at church functions to save us from having to wash our food tablecloths which stain easily. Bought for the last 3 years, love this item for my Easter table. Have one already and was pleased with it until the cat shredded it on two sides. can just wipe up spills quickly. Great value for the cost. We have purchased these table coverings before and they held up nicely and are attractive. I need some new tablecloths, and these look nice..One for every day and one for company....M.
These tablecloths are some of the few that fit our round tables. The lace is pretty and dresses up the tables for special occasions. We liked it because it was vinyl. Hopefully it will look as good on my table. It will not be stained by wine or other beverages. I picked this item for the look and easy clean. We'll see how well it looks and cleans! I find these table covers useful in my kitchen with grandchildren. I have bought this tablecloth before. It is very pretty, washes well. I have a glass top table and this will be a beautiful cover. We have used this table cover in our church for years. They will last a very long time when taken care of. 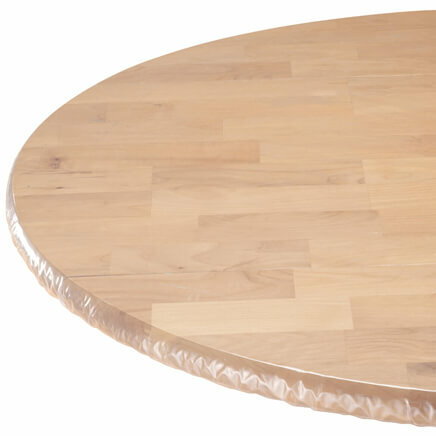 I'm looking for tan/brown basketweave plastic table cloths in 118 inch x 50 inch or so size? Like your item number 348295. Do you carry that size and color or can you get them. I would need 10. BEST ANSWER: Thank you for your question. Unfortunately we do not carry that size. All sizes we have are listed. We will pass this suggestion along. We hope this information will be of help to you. 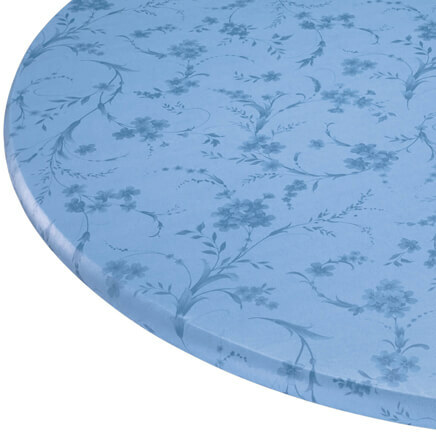 Do you need another table cloth under the vinyl lace tablecloths? I have a table pad that has discoloration I dont want those to show through. It is pretty thick so I do not think you would necessarily need something under it. I did put a thin pad under it just for extra protection of my table. Yes, you will need another tablecloth underneath the vinyl. 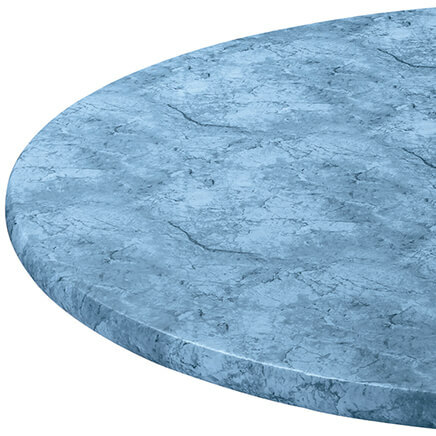 I use pastels, will make your table look elegant. 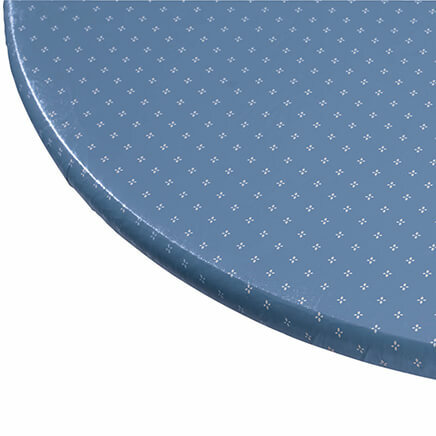 does this tablecloth have holes in the design? BEST ANSWER: I bought it as a gift for a family member. It looked like there were little holes. However I can't be 100% sure since I didn't open it. Yes, they are very small; looks good w/ a colored tablecloth under it , or used alone. My table is 30 by 96 do you have a table cloth that will fit it - what I see is to wide ??? BEST ANSWER: Thank you for your question. Unfortunately we do not carry a table cover in that size. We hope this information will be of help to you. Is this tablecloth available in oval size? BEST ANSWER: Thank you for your question. You may consider an oblong, although the edges will be squared. We hope this information will be of help to you. BEST ANSWER: Thank you for your question. 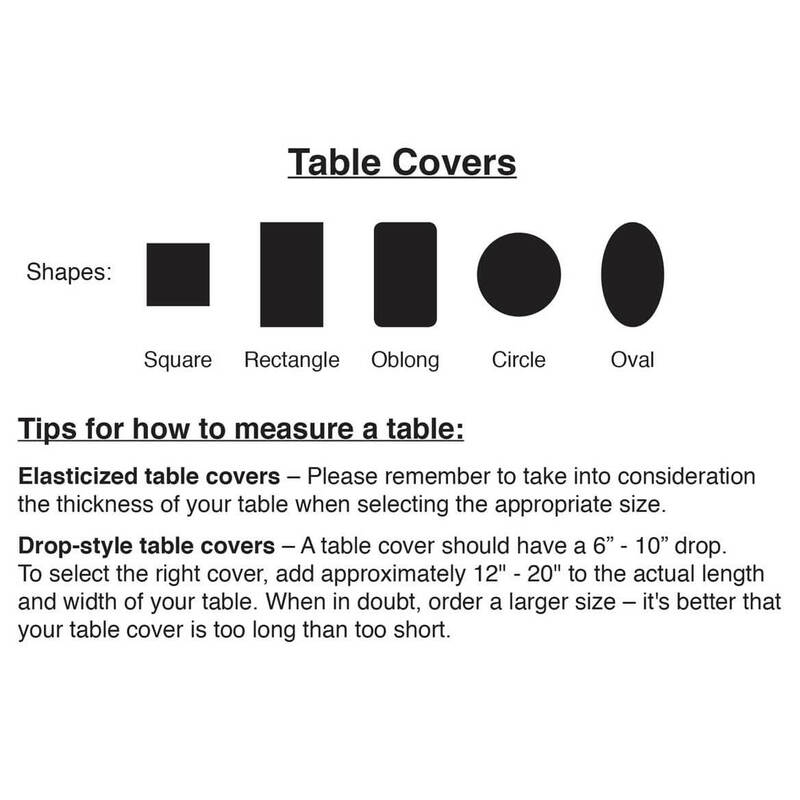 To best know what size table cover you need it is best to measure your table for the size. We hope this information will be of help to you.